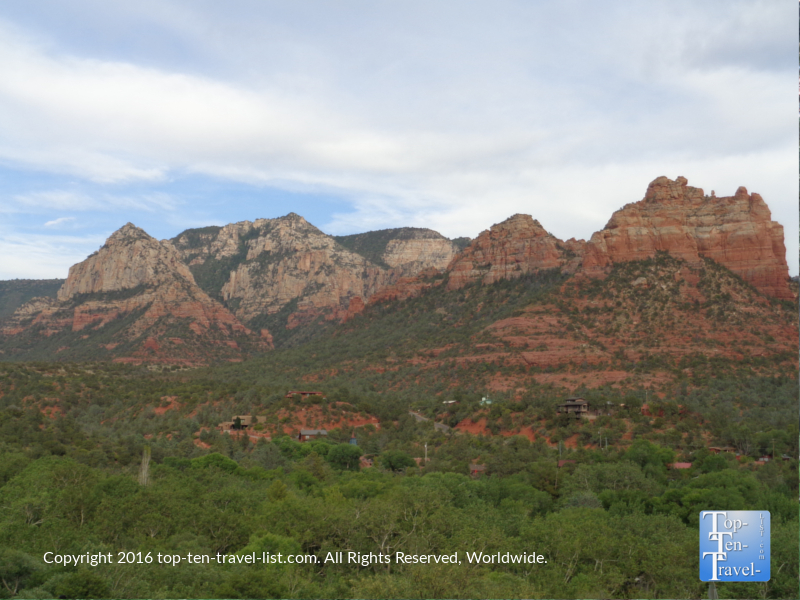 5 Places to Enjoy the Views in Sedona without Hiking - Top Ten Travel Blog | Our experiences traveling throughout the US. 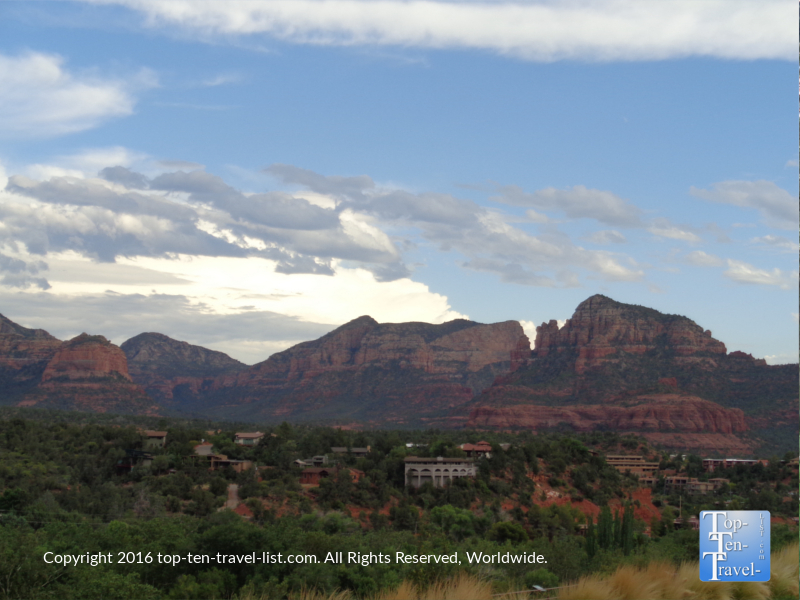 Sedona, Arizona is one of the most gorgeous vacation destinations in the Southwest, if not the entire country. With brilliant million+ year old rocks dominating the landscape, 100’s of miles of colorful red rock trails, and several healing vortex sites (more on vortexes later on), Sedona really is the perfect vacation choice for anyone seeking a relaxing trip, accompanied by bountiful recreational & relaxation activities in a one-of-a-kind natural setting. 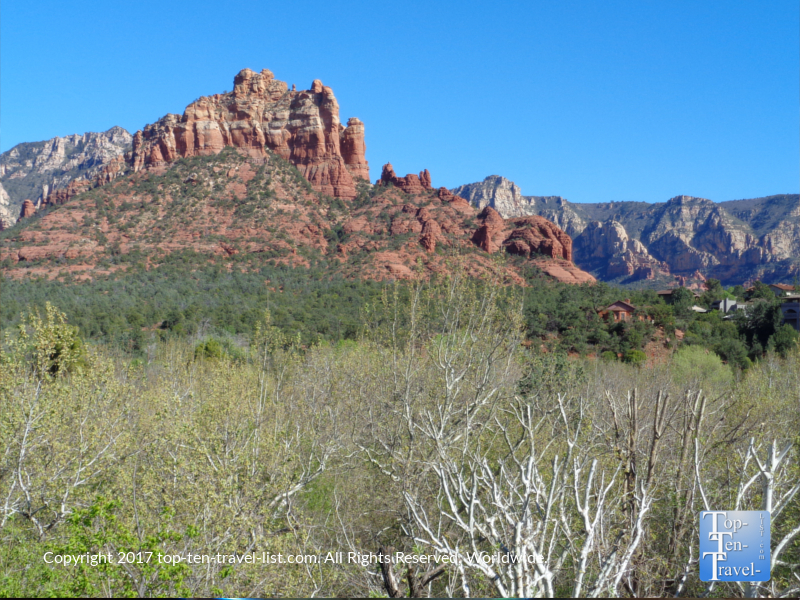 Although exploring a few of the breathtaking hikes is most recommended (check out 12 of my favorite Sedona hikes), there are numerous additional ways to take in the majestic scenery without embarking on a difficult hike. 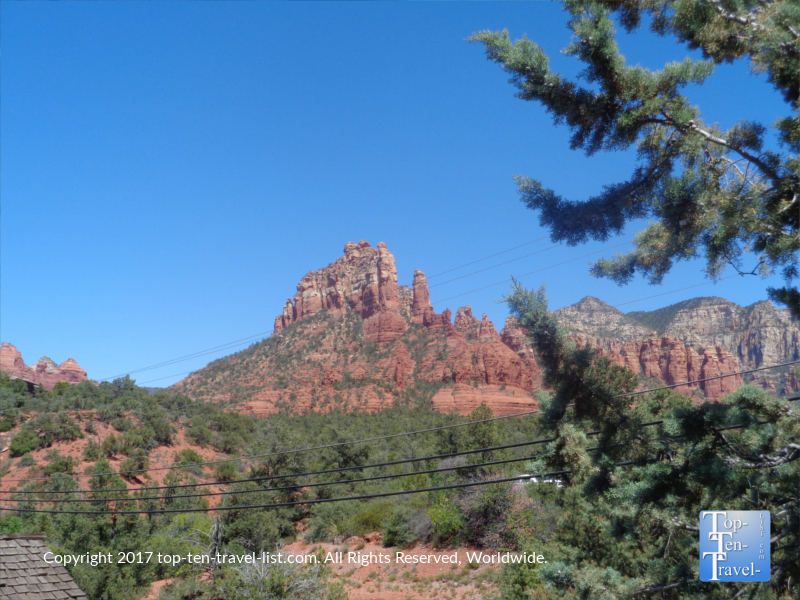 For those of you seeking a bit more relaxation as opposed to a strenuous workout in the intense desert heat, here are 5 of the best Sedona destinations for soaking in the fantastic red rock scenery – all requiring little to no effort. Sedona’s Chapel of the Holy Cross is built in between 2 red rock formations. It’s quite a sight to see – be sure to plan for a stop here at least one day of your trip! 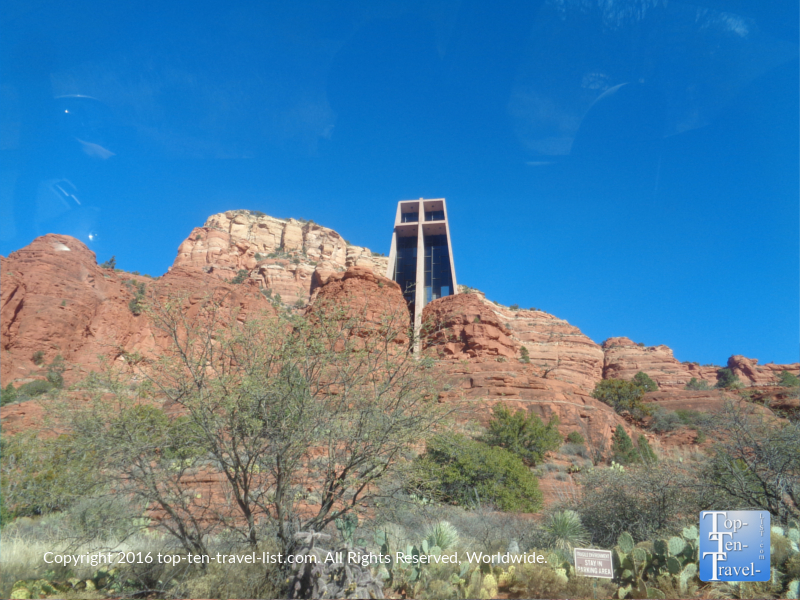 The Chapel of the Holy Cross truly is an architectural wonder like no other in the world- an absolute must-see for any Sedona newcomers. This unique Roman Catholic church was built in between 2 massive red rock formations, and features spectacular views both inside and out. Although the chapel is not open for services, anyone can come in to meditate, pray, or light a candle in honor of a loved one. As soon as you step inside, you will notice the beautiful stained glass windows and magnificent red rocks in the background – this really is a chapel like no other in the world! 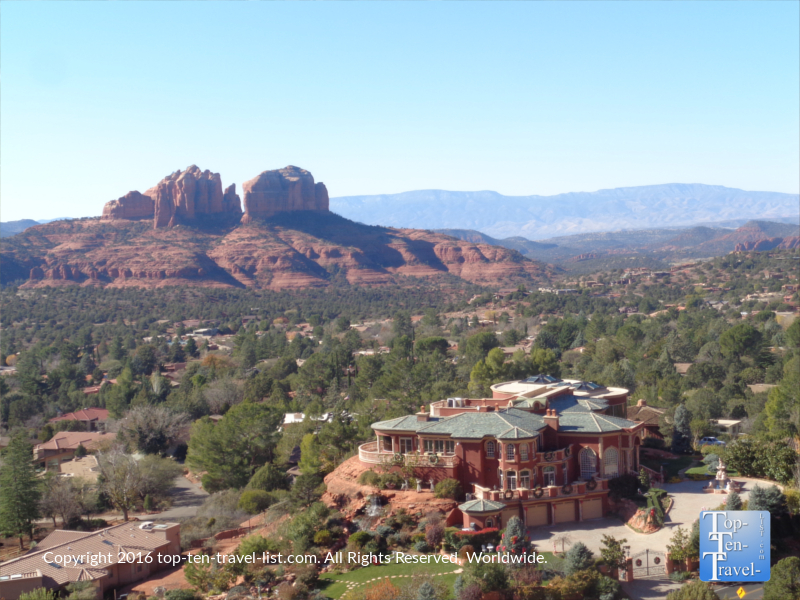 Surrounding the chapel are some of the most extraordinary views in all of Sedona – no hike required! 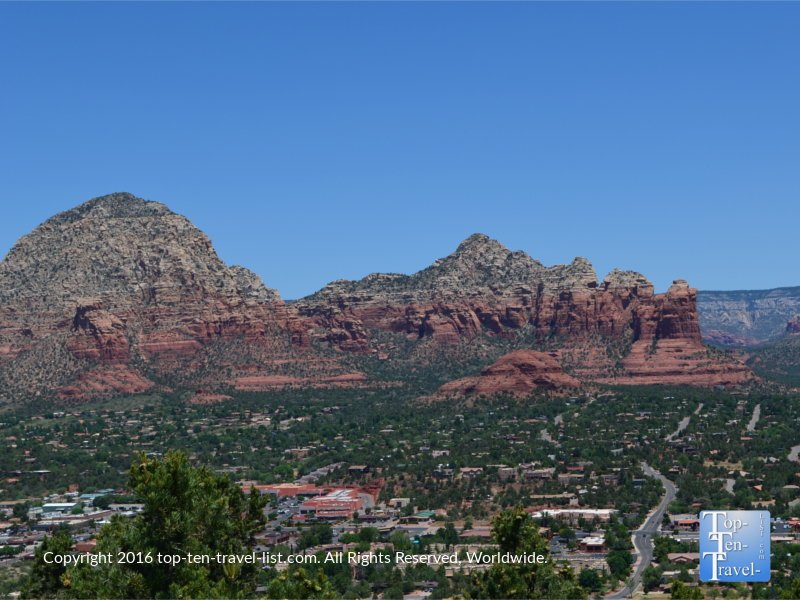 The Airport Mesa overlook is one of Sedona’s most popular destinations for photography. 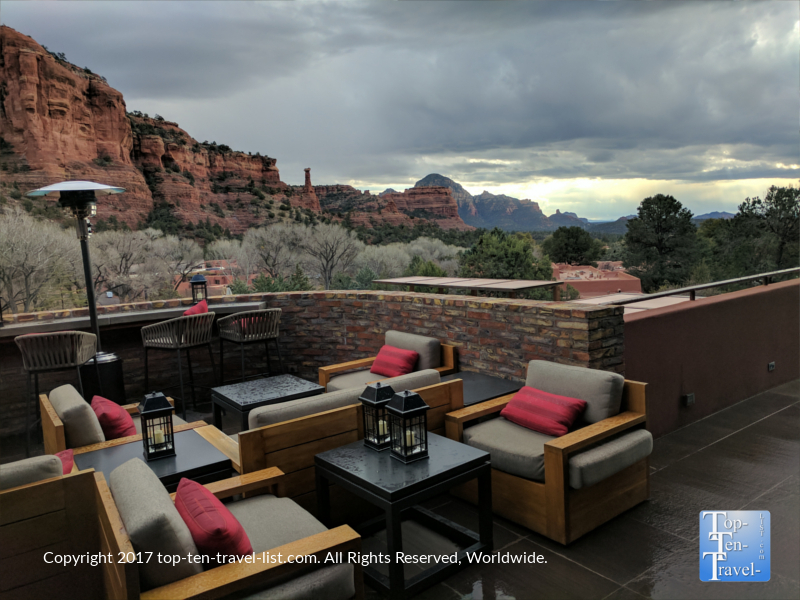 It is also the go-to spot for taking in a breathtaking sunset over the red rocks – one of the most memorable things you can do on any Sedona vacation. Airport Mesa is considered to be one of Sedona’s sacred vortex sites (The Chapel of the Holy Cross mentioned above is another). A number of hikes (including the must-do Boynton Canyon) are also considered to be vortex sites. A vortex is basically an area of concentrated energy that rises from the earth and supposedly balances energies & provides healing powers to whomever comes across it. Thousands of tourists are attracted to the area each year to experience the supposed benefits of this special vortex energy. Amazing red rock views from the Airport Mesa trail – a must-do hike if you are up for a scenic desert adventure! At Airport Mesa, you may just walk away with more than a simple photograph! If you are up for a bit of exercise, the Airport Mesa hike offers some of the most extraordinary 360 degree views in all of Sedona. At 3.5 miles round-trip and mostly flat, it is one of the easier options in town, although not recommended for scaredy cats due to several very steep drop offs! Check it out if you are up for a longish, yet relaxing hike with unending views of the red rocks. 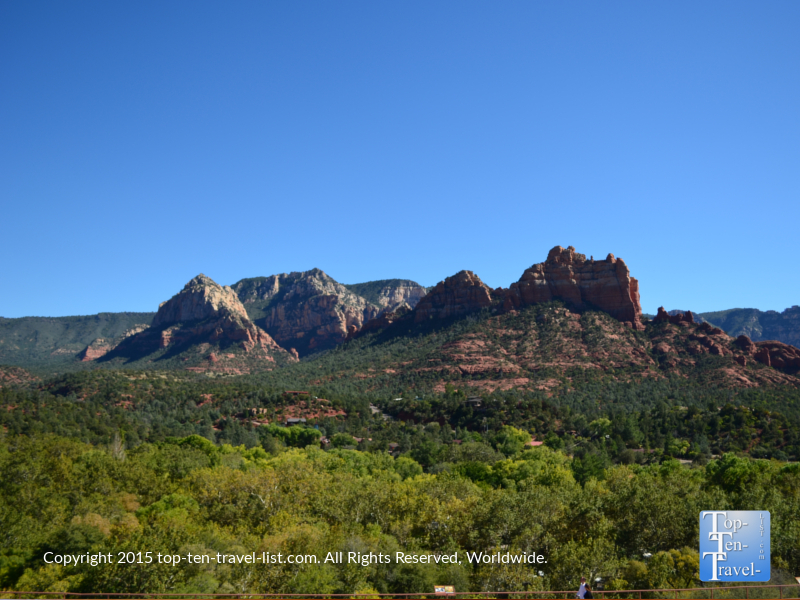 Just strolling around Sedona’s charming tourist hotspot for a half hour or so, you will be able to take in some pretty magnificent scenery without much effort at all. A quick walk along the history stroll will give you a bit of background history on the ancient rock formations, along with more picture-perfect photos than you could ever possibly imagine. Asides from the grand views, Uptown is a nice little touristy area where you can kill an hour or 2 in between other activities. 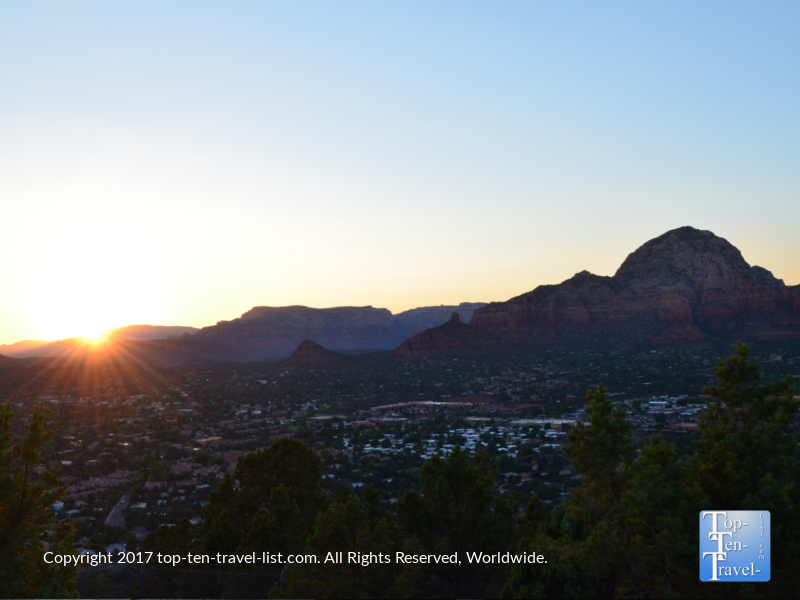 Touristy shops selling Southwestern specialties, Mexican and Southwestern themed restaurants, galleries featuring the work of local artists, refreshing smoothie and ice cream shops, and more can be found in Sedona’s most popular tourist stop. From here, you can also sign up for the uber popular Pink Jeep and trolley tours, although a hike is a less costly, not to mention a more memorable & rewarding experience. Be on the lookout for great annual events such as the St. Patrick’s Day parade and Christmas tree lighting, as well as ongoing events like the 1st Friday Art Walk. 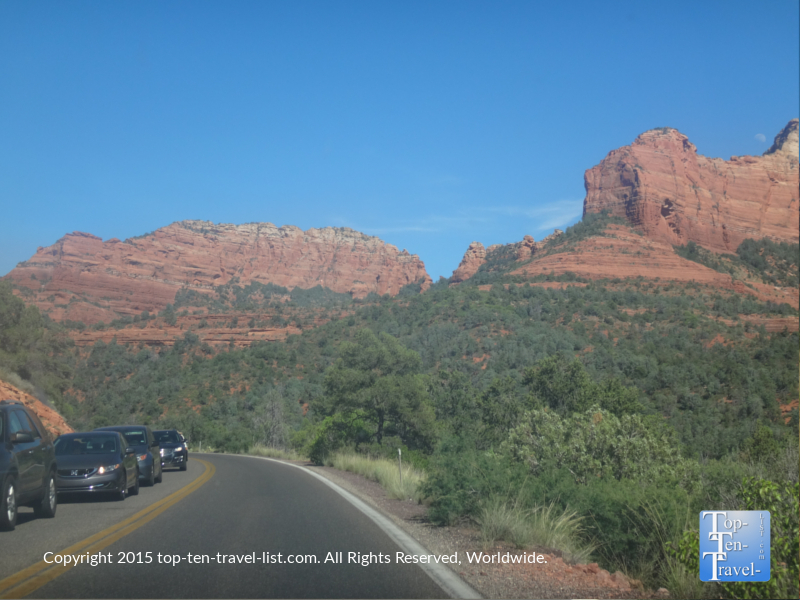 Just driving around Sedona is a mesmerizing experience in and off itself. If you are unable to do a hike for any reason, a picturesque drive is your next best bet. 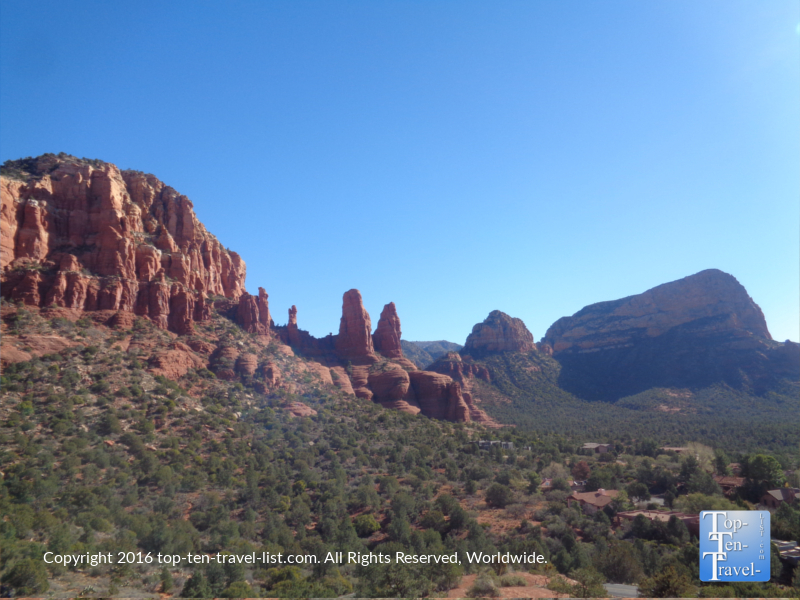 There are 2 main drives to consider if you are looking to take in the best Sedona has to offer: Red Rock Scenic Byway and Oak Creek Canyon. 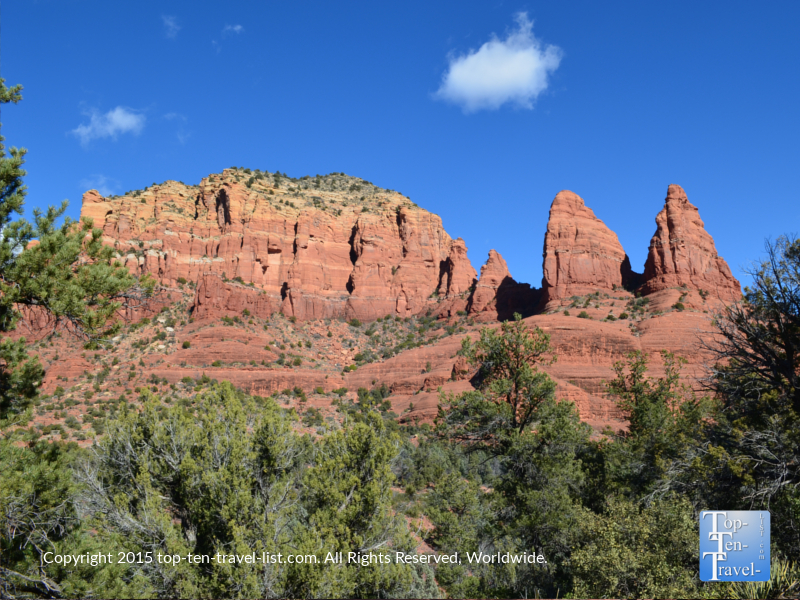 Red Rock Scenic Byway (SR 179) will take you past several of Sedona’s most prominent red rock formations. Drive slow and enjoy a cruise through one of the country’s most unique landscapes. Don’t worry – numerous pullouts along the 14 mile route give you the opportunity to stretch, take some photos, or simply just lust after the views. Or, better yet, stop for a hike along the magnificent Little Horse trail. Another picturesque drive to add to your itinerary is Oak Creek Canyon (AZ 89a), a name given to the 14 miles of picturesque scenery located in between Flagstaff and Sedona. This drive is really unique and dramatic, as both the views (from ponderosa pines, to flowing creeks, to towering red rock formations) and elevation (4000-7000ft) vary greatly along the route. 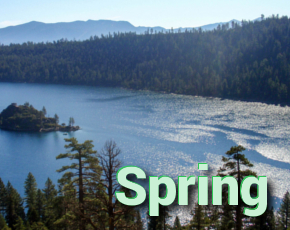 Offering dramatic red rock vistas, quaint views of the perennial creek, and majestic views of the towering ponderoa pine forests, it really is the most stunning drive in the entire state, and definitely not to be missed on any vacation to the region! Numerous activities along the way – scenic overlooks, hikes (check out the Cookstove & West Fork), Native American craft markets, restaurants (be sure to stop for breakfast at Indian Gardens! ), secret swimming holes, Slide Rock State Park (an unusual park featuring natural waterslides carved from the red rocks) easily make this a half-full day activity! 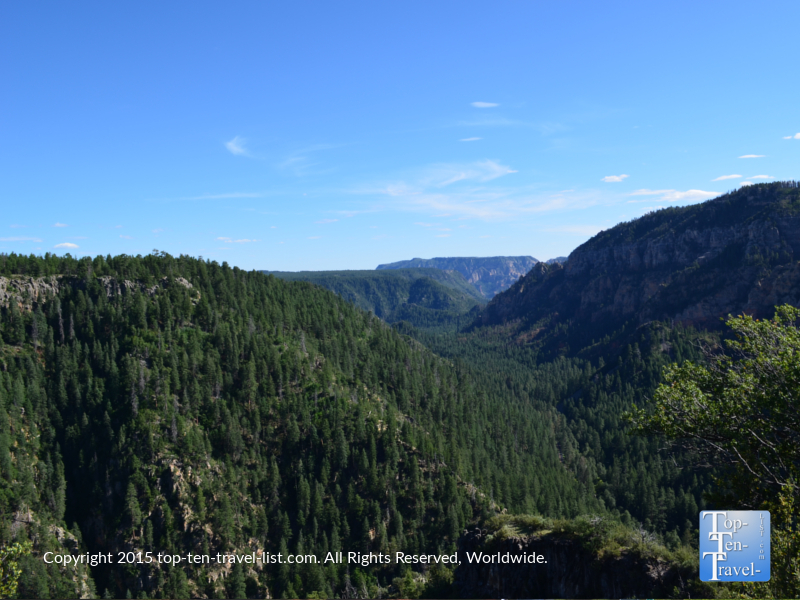 Oak Creek Canyon is busy year-round due to the fabulous views. Plan your visit during the winter (outside of holidays) and fall (outside of peak color time) for fewer crowds! 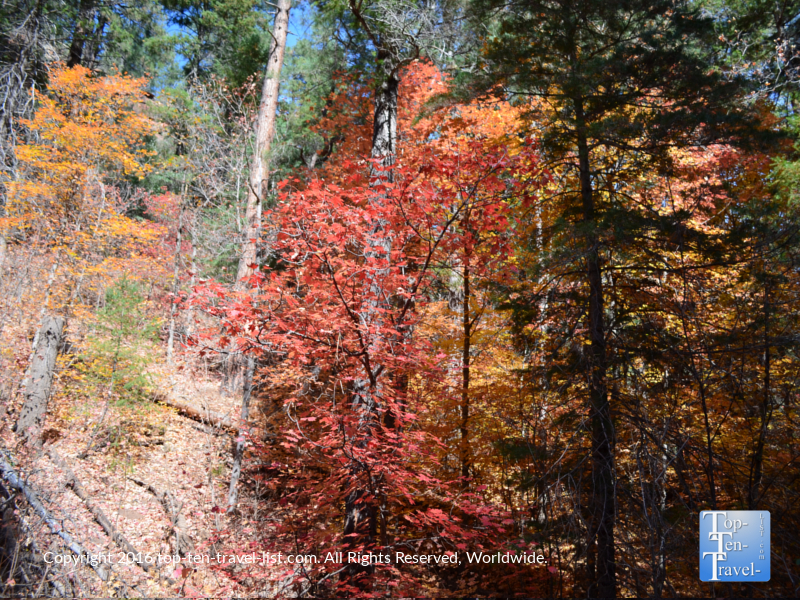 The West Fork trail along Oak Creek Canyon is a hotspot in the fall due to the beautiful fall colors, resembling those found in the East. This easy, flat trail features a number of fun creek crossings. 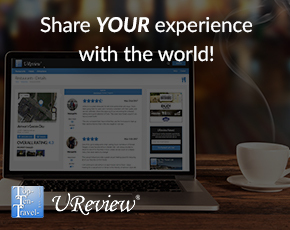 Check it out if you have the extra time! 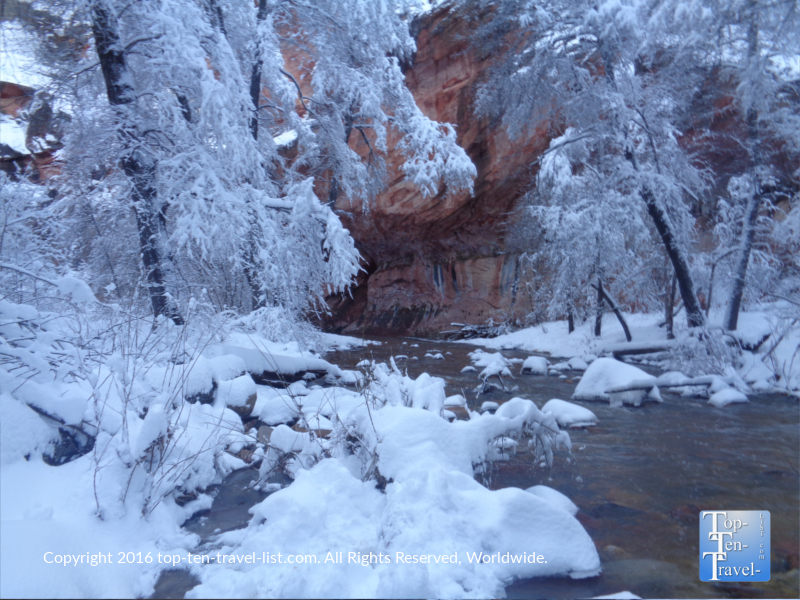 Winter is a magical time in Oak Creek! 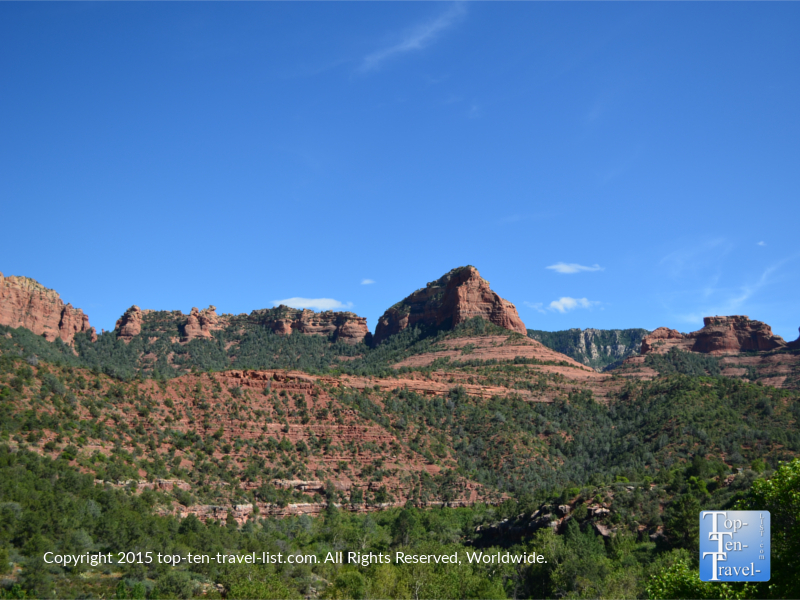 Oak Creek Canyon Overlook – great views and lots of Native American craft vendors. A great break along this scenic drive! Scenic outdoor dining at Che-Ah-Chi at the Enchantment Resort: the top choice in town for brunch with a view! 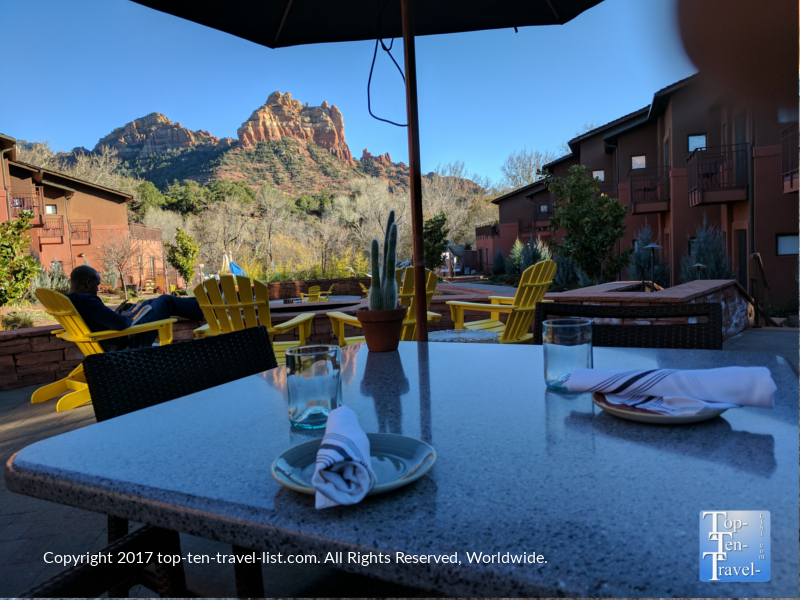 It’s no surprise that numerous restaurants have taken advantage of Sedona’s truly inspiring setting by building their dining space around the red rocks. 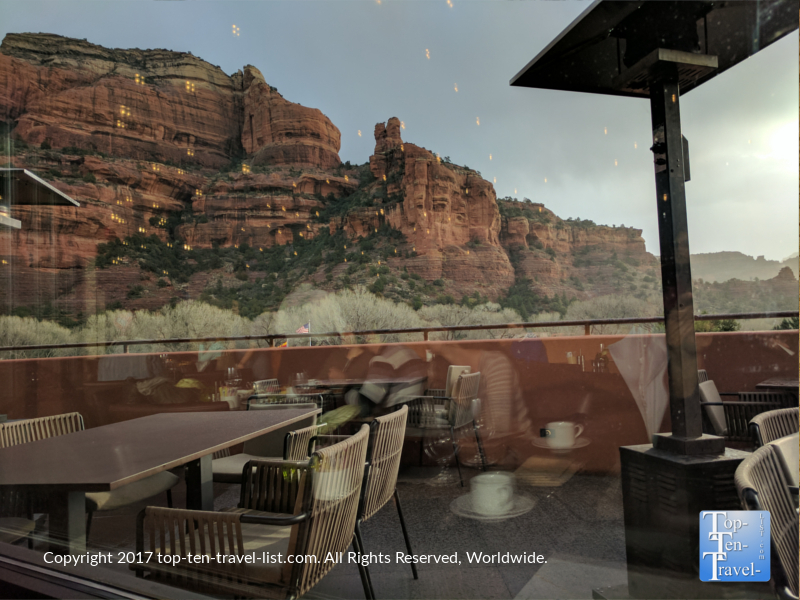 Although some restaurants offer great food & others amazing views, just a handful really please by offering both quality food and tremendous views of the red rocks via awesome outdoor patios. Below are my picks for the best dining-with-a-view experiences in Red Rock Country! The patio at The Hudson offers some of the most spectacular red rocks in town! The relaxed ambiance at Salt Rock, which includes fabulous red rock views and beautiful desert landscaping, makes it a perfect vacation choice! For soak in tremendous red rock scenery, take a seat at the outdoor patio at Wildflower Bread! Hideaway House is another top choice for relaxing red rock views!